The HSG series voltage transformers are often built in test equipment or permanent installations. Output voltage is controlled with a large, slip-protected knob. Output voltage is increased linearly as the knob is turned clockwise. The user is required to add adequate external over-current protection device like fuse or circuit breaker. All models are suitable for 50 Hz / 60 Hz frequency range. Single- and three-phase models are available with various current ratings. Output voltage is precisely controlled. Autotransformer design allows optional voltage boost. Because of demanding applications all Metrel variacs are designed to exhibit superior resistance to high temperature, humidity and mechanical shocks/vibrations. Used in hardwired, permanent installations wherever operational or performance points need to be varied. Variable, coupled with insulation transformers are utilized for personnel safety in addition to provide variable voltages for testing purposes. 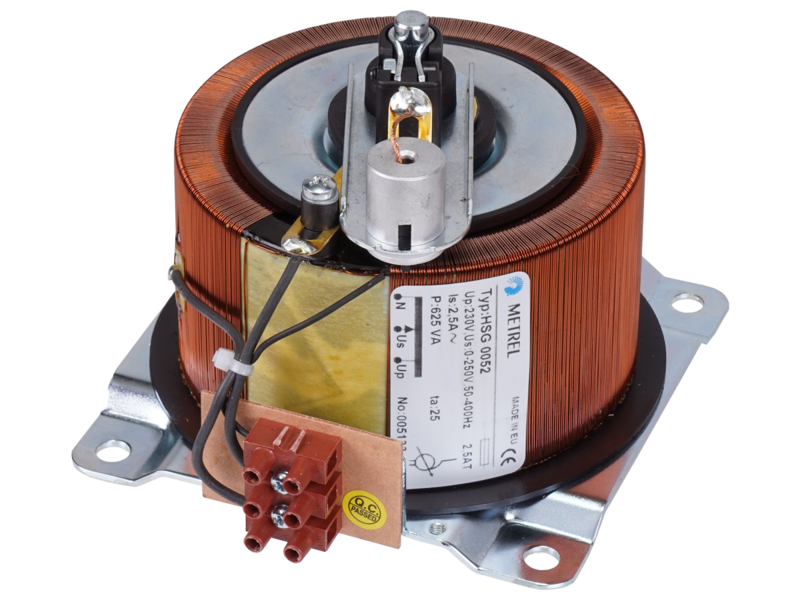 In general they are equally suitable for any of the testing, engineering or control function like ordinary variacs based on autotransformer design. Additionally they can isolate sensitive equipment from interference and ground noise.